Babblings of a Mommy: Cyber Monday Deals You Don't Want To Miss! Cyber Monday Deals You Don't Want To Miss! The older I get, the less I feel like waking up at the crack of dawn staying up all night--fighting for my life for doorbusters. Especially when I have Cyber Monday to look forward to! No long lines. No shoving matches. Just awesome deals that I can buy from my bed. Now THAT'S my kinda shopping! Starting now 40% off EVERYTHING! Enter code shop40 at online checkout. Loaded with a selection of discounts, offers and online sales across the board. Take $50 off any boot or bootie purchase by entering "50BOOTS" between now and Cyber Monday. Starting Monday save up to 80% on all your makeup faves, from Lip Crushes to Convertible Colors. Sale ends December 2. Now and Monday, incredible online web-busters, plus an extra 25-40% off clearance items. 40-50% off items. Too many to name. Cyber Monday, spend $100 and you'll score a limited-edition Erickson Beamon makeup case, stuffed full of cool beauty goodies. It's only available while supplies last. Starting on Monday and running to November 30, type in code CELEBRATE11 and receive 30% off your entire order. Save up to 75% on select items. Plus get a free make-up bag with 12 samples with any $25 purchase. Valid thru Dec.1. Enter code FROMSEPHORA at checkout. Cyber Sunday and Monday take 30% off entire purchase on all 4 brands. Enter HUGECYBER at checkout. Cyber Sunday and Monday. 20% off shoes and apparel brands. Enter HUGECYBER at checkout. Accessory sale. Buy two accessories, get 20% off; buy three and it's 25%; score 30% off of your purchase of four accessories. Cybear Monday. 8 animals for $8. Great gifts for $5, $10, $12, $15, $20, $30 and $20off. 70% off thousands of video games, action figures, outdoor play, learning toys, dolls & more. One of my favorite destinations on Cyber Monday! Up to 60% select items, plus free shipping. 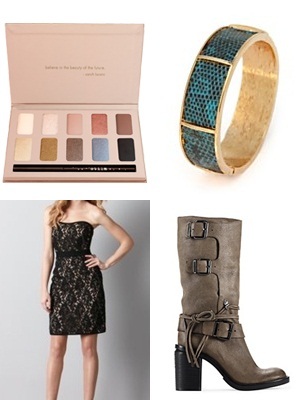 photo (left to right): stila palette, intermix bracelet, loft dress, vince camuto boots.